InstaNatural is a company that formulates beauty products using natural and organic ingredients, so they are gentle on the skin. 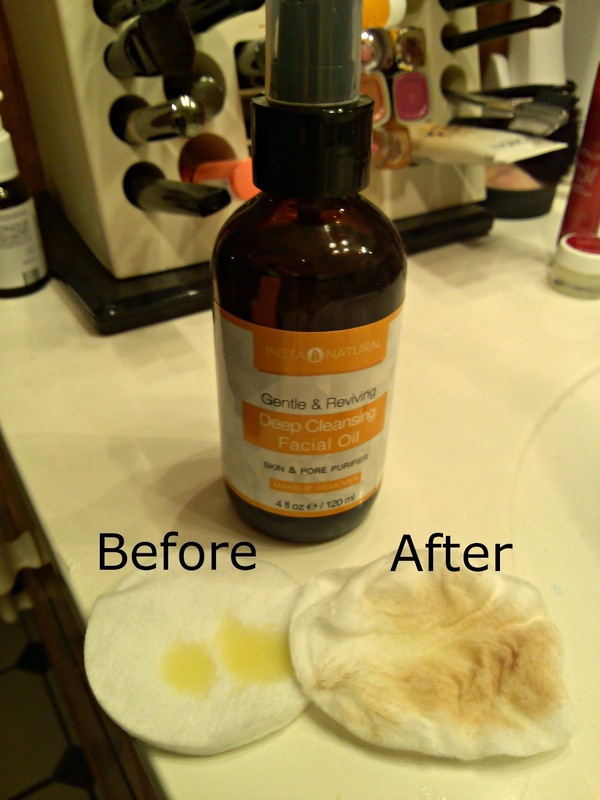 I have never used a cleansing oil before, but just had to give their new Deep Cleansing Facial Oil a try. Basically it is an oil that melts away dirt, makeup, and impurities without removing skin's natural oils or messing with your pH balance. Active ingredients include: Jojoba oil, Olive oil, Lavender essential oil, Hemp oil, Sea Buckthorn oil, and Pink Grapefruit oil. The oil is a yellow-ish thick oil that comes out with a pump. I was a bit scared to try it because when you think of oil, you think it will make your skin more oily. I have combination skin so I get lots of shine in my t-zone and a combo of dryness and oiliness in my cheeks. I applied 2-3 pumps of oil to a cotton pad and spread it around my face, then rinsed with warm water per the instructions. It removed all of my makeup and didn't leave an oily residue like I was expecting. My skin felt soft and moisturized and not at all irritated or greasy. The real test, though, was the next day. I could not believe how good my skin looked the next morning, and it was way less shiny all day than it usually looks. I didn't even have to put on a powder to combat the shine. So surprisingly, this cleansing oil actually made my skin less oily. I feel like the secret is that instead of stripping natural oils like many harsh products do, this keeps them intact so the skin isn't working even harder to overcompensate and produce more oil. That's the vicious cycle of many harsh acne and oil-fighting products. I also use this oil to remove my lipstick and mascara. I found that for use as an eye makeup remover, it was easiest to put a squirt of oil on my fingers and apply to my closed eyelid, and then take the cotton pad to wipe the makeup off. Otherwise it seems like the cotton pad soaks up too much of the product before it gets to my makeup. It only took a couple squirts to get both eyes completely clean, plus it didn't irritate or sting my eyes at all. I am pleasantly surprised with this product and I recommend giving it a try to see how it works for you.